PVC vinyl fencing is a popular alternative to wood fencing, and one of the main reasons for this is its durability. While wood can splinter, warp, or rot as a result of weather (and improper maintenance), PVC vinyl fencing is not affected by the elements, making it a great choice for outdoor applications in climates that are subjected to a wide variety of weather. PVC stands for polyvinyl chloride. PVC is made up of carbon atoms which are bound to chlorine atoms. The nature of the chain the chlorine and carbon atoms form (one chlorine atom binds to every other carbon chain), makes it very resistant to oxidation, the reaction which causes metals to rust. Even other plastics, such as those made of carbon and hydrogen atoms, are more likely to oxidize over time due to their chemical makeup. So PVC’s chemical composition makes it very resistant to the elements, and great for outdoor use. PVC vinyl fencing is also great at imitating wood, making it a great alternative to wood fencing. 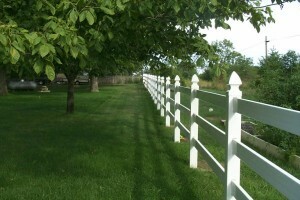 If you’re looking for an incredibly durable fence, PVC vinyl may be the way to go for you. I can’t believe it’s not wood! This entry was posted on Friday, March 7th, 2014 at 3:34 pm. Both comments and pings are currently closed.